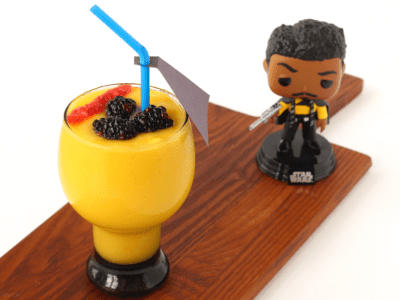 Celebrate Solo: A Star Wars Story on Blu-Ray September 25th with this kid-friendly Lando Calrissian Smoothie, perfect party drink idea! This post is sponsored by Star Wars. All galactic opinions are my own. Lando is the original “smooth criminal.” That suave demeanor, that glide in his step, and boy can that man talk you into a sweet deal, I’ve been a huge fan of this Star Wars character from the beginning. Only seemed fitting with Solo: A Star Wars Story coming out on Blu-Ray on September 25, 2018 that we celebrate the original smoothie with his own smoothie. Yes, my friends – a Lando Calrissian Smoothie. Can you taste the amazingness yet? 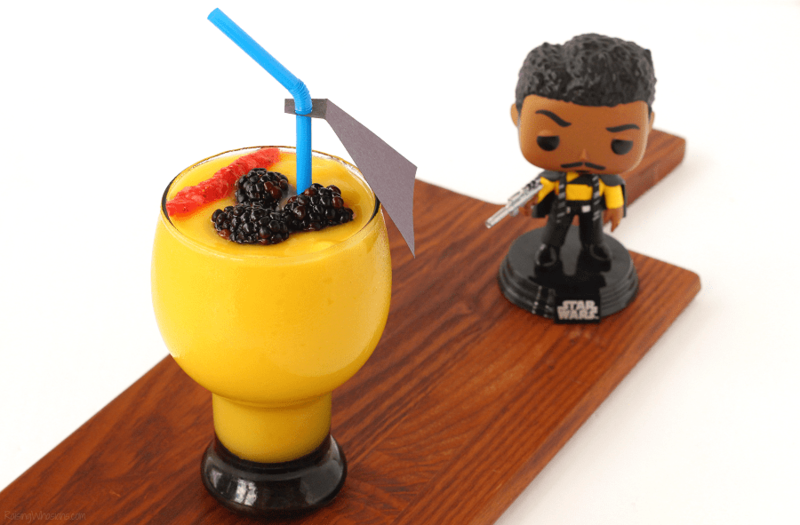 Check out how to make your own kid-approved Lando Calrissian Smoothie (gluten-free and dairy-free, complete with straw cape!). Plus find out why your family needs to own Solo: A Star Wars Story on Blu-Ray faster than the kessel run in 12 parsecs. 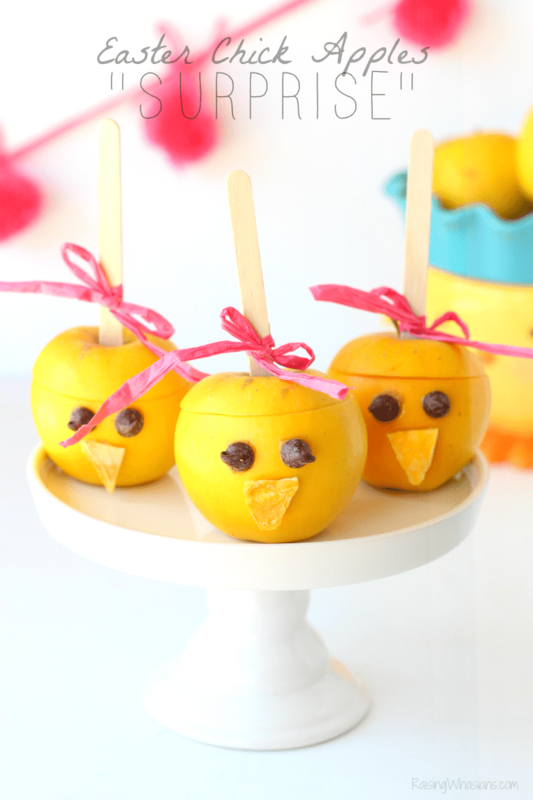 Need a healthy back-to-school snack idea for your kids? 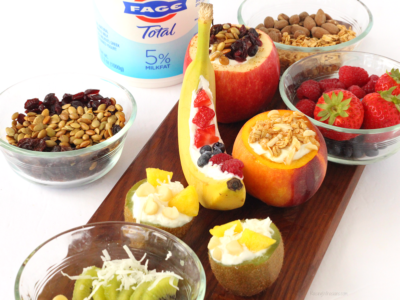 Try these 4 Unique Fruit Bowls for a Kid-Friendly Yogurt Bar! This post is sponsored by Everywhere Agency on behalf of FAGE. All delicious opinions are my own. Bowls are SO last school season! Do your kids come home from school STARVING for a snack? Two kids in full time school this year means all hands on deck the moment they step off of that bus. “Can I have a snack now?” is the song on repeat during our walk home. And as soon as they drop our backpacks at the door, they’re mouths are open like little baby birds. If it were up to my kids, they would be reaching for the cookies, chips and candy. But if we learned anything from our childhoods, that kind of snack doesn’t fly with this mom. We all want better and healthier after-school snacks for our kids. But how do we make healthy food look more appealing to kids? It’s all in the presentation. 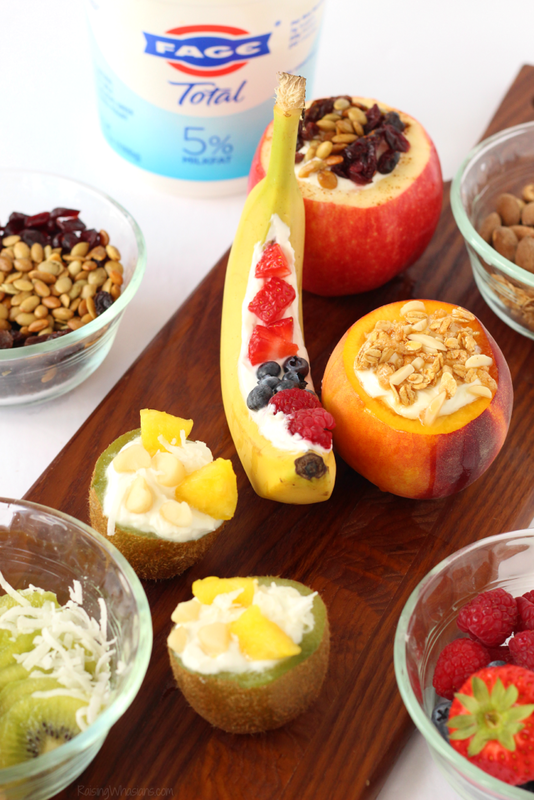 You won’t need to wash dishes with these 4 unique fruit bowls and this ultimate kid-friendly yogurt bar. With 4 fun fruit bowls to hold your child’s after-school snack, they’ll be asking for the good stuff. Pass all of the healthy toppings and FAGE yogurt, please! This is a sponsored post written by me on behalf of Boar’s Head. All opinions are 100% mine. 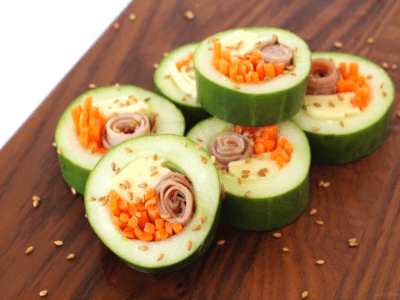 Make lunchtime fun for your kids with this easy Kid Friendly Cucumber Sushi recipe. Perfect back-to-school lunchbox idea for kids, this delicious combo will have your children gobbling “sushi” in no time! Strong opinions and even stronger taste buds! Got a picky eater heading to school this year? Me too! My kindergartner is more stubborn and independent than ever. With a week of school under her belt, she all of a sudden has become an expert when it comes to packing her lunchbox. And she’s not scared to speak her mind, especially at 7 o’clock in the morning. Looking for a healthy back-to-school option? 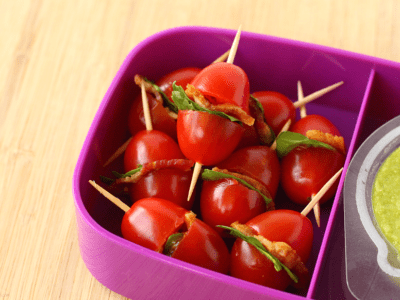 Power Your Lunchbox with these Sandwich-Free BLT Bites for Kids Dipped Two Ways! This post is sponsored by Produce for Kids. All delicious opinions are my own. I dip, you dip, we dip! There’s seriously nothing like the classic flavors of a BLT. Am I right? But with Little Miss heading to kindergarten this year, sandwiches aren’t always her thing. But bacon – always bacon! 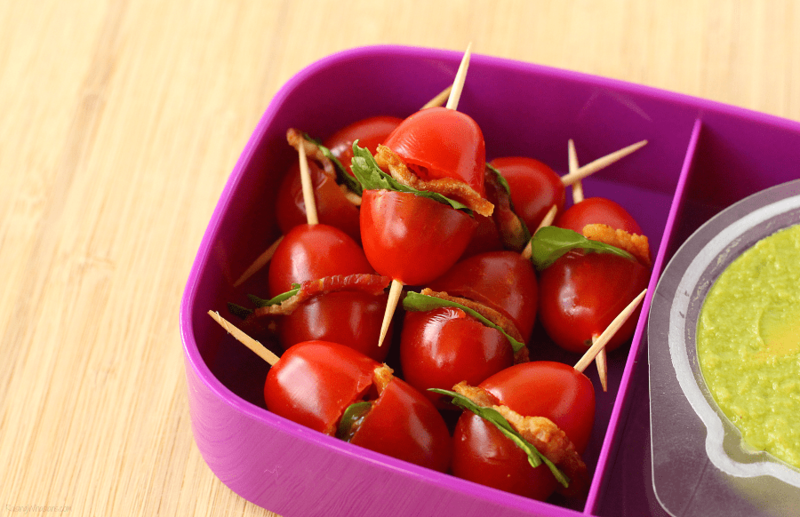 To make her lunchbox just a little more kid-friendly this fall, we’re dipping into some fun with these Sandwich-Free BLT Bites for Kids, Dipped Two Ways! Start off the back-to-school season with healthy meals for the whole family and pledge to Power Your Lunchbox with Produce for Kids this fall. You can instantly donate $1 to Feeding America and give back to kids in need, grab produce coupons, be entered to win prizes and more! Busy morning? 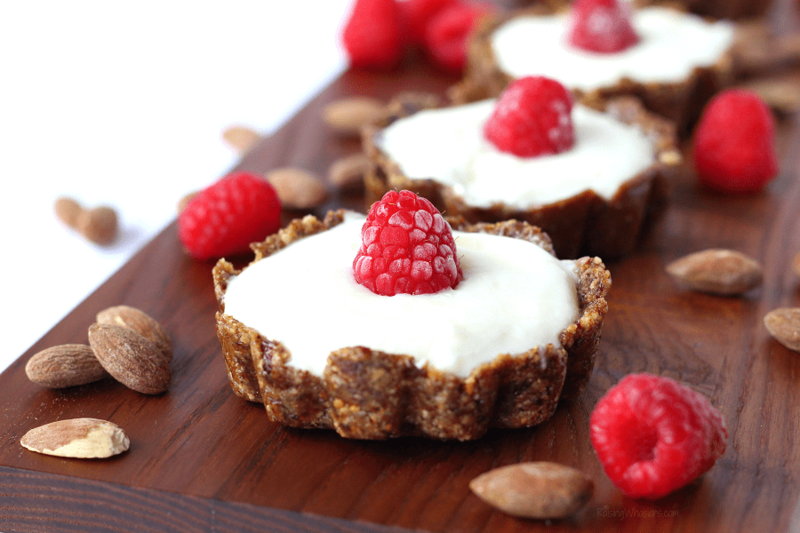 Try these Easy Yogurt Tarts for a Quick Breakfast Idea! Your kids will love them! This post is sponsored by Produce for Kids. All delicious opinions are my own. So I really thought our summer was going to slow down considerably. WRONG. My beautiful princess is proving that her will to wake up at “regular school time” is stronger than our summer schedule. Even more hilarious, her daily sleepwalking to my room has made her more indecisive as ever when it comes to the first meal of the day. Mom truth: Breakfast trends roll through this house faster than fashion trends. So that means I need options, lots of them. You know, just in case she changes her mind eleventy thousand times. So how am I making breakfast kid-friendly and princess-approved? Try these Easy Yogurt Tarts for a Quick Breakfast Idea. 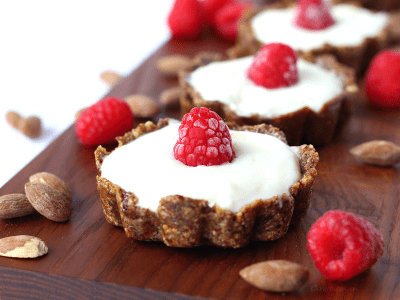 No bake, gluten free, packed with protein and healthy (heck, yes! ), I can quickly pop one out of the freezer when she wants “cake” for breakfast. Find out making these adorable tarts are donating meals to local families in need with Produce for Kids this summer and grab your $2 Publix produce coupon too! 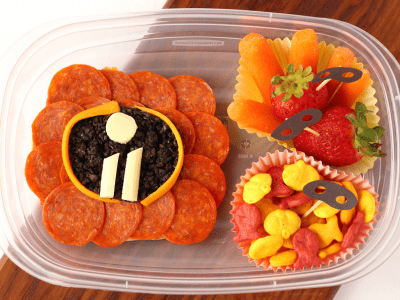 Get ready for Disney Pixar’s Incredibles 2 movie with this Easy Incredibles 2 Bento Box Idea + Super Cute Mask Food Picks. This post is sponsored by Frigo® Cheese Heads® Cheese. All yummy opinions are my own. So in case you were wondering, we’re kind of “incredibly excited” for a new film coming out this summer. Disney Pixar’s Incredibles 2 is at the top of our movie must-watch list this year. 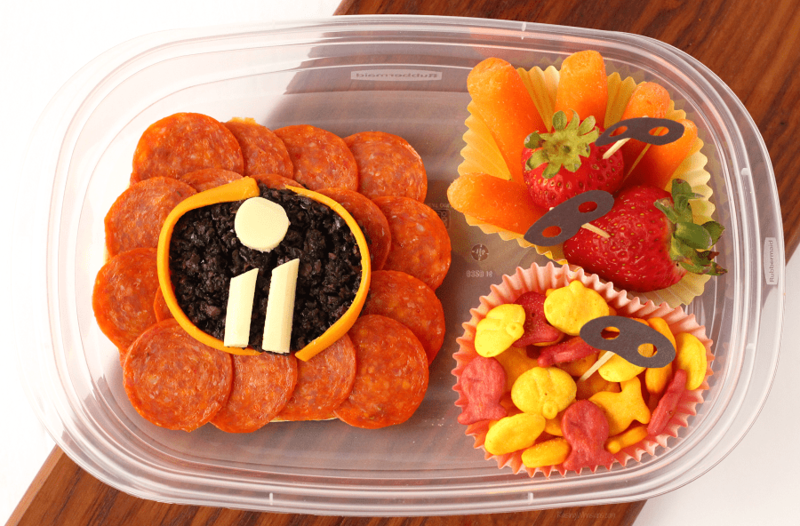 To celebrate, we’re bringing the fun to your summer and back-to-school lunches with an Easy Incredibles 2 Bento Box Idea + “Super” Cute Food Picks! Fuel and inspire your little super heroes this year with Frigo® Cheese Heads® and find out how you can instantly win fun prizes this summer! Are you incredibly hungry yet? 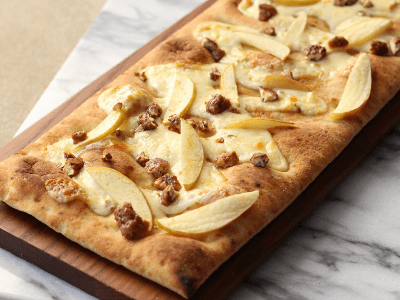 Spoil mom with deliciousness with these 4 Fancy Mother’s Day Brunch Bites You Can Make with Snack Cheese. This post is sponsored by Frigo® Cheese Heads® Cheese. All yummy opinions are my own. I. Love. Cheese. Mother’s Day is just around the corner, and I’m already dreaming of all of the delicious Mother’s Day brunch ideas. As a busy mom, my house may never be overflowing with fancy fromage choices. But you know what you’ll always find in this mom’s fridge? String Cheese, because kids. Fancy and delicious Mother’s Day appetizers don’t always have to be complicated. 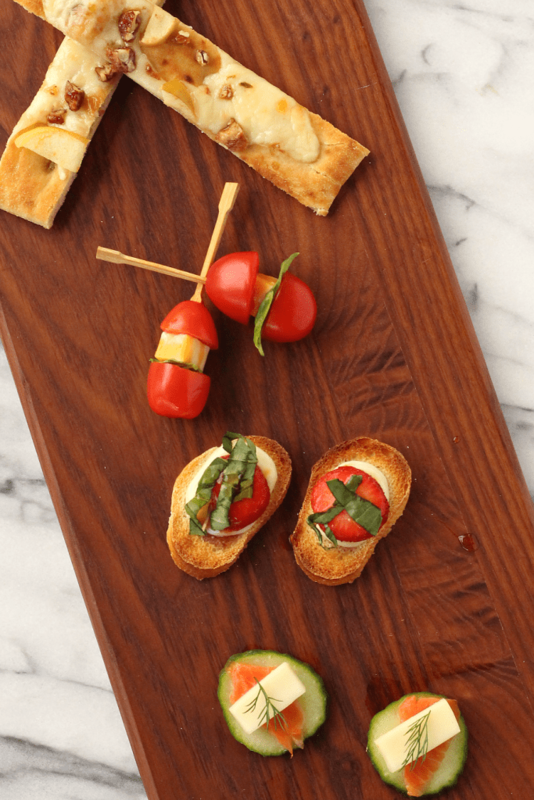 Spoil mom’s taste buds with these 4 Easy and Fancy Mother’s Day Brunch Bites You Can Make with Snack Cheese. She’ll love them, promise. Ready to power up for Avengers: Infinity War? 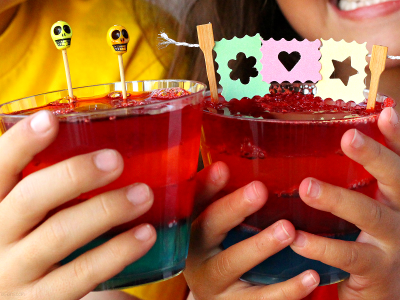 Get ready with these 6 Healthy Avengers Approved Recipes for Kids. This post is sponsored by Dole. I have received compensation in exchange for this post. As always, all delicious opinions are my own. 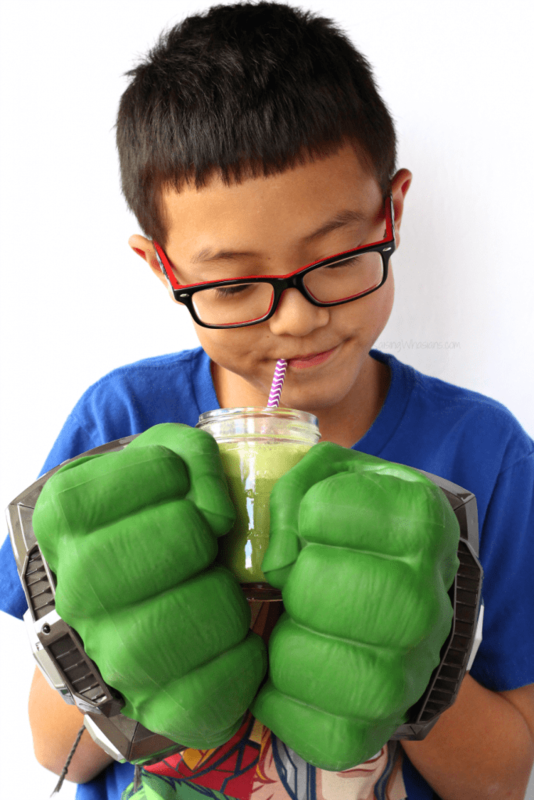 While some days it may feel like an “infinity war” to get my kids to eat healthier, Dole and Marvel are here to inspire parents with healthy Avengers recipes for kids – super hero approved! Let’s team up with our favorite Marvel super heroes this spring with Avengers: Infinity War and the Powering the Hero Within campaign to power our kids with tasty and healthier meal, snack and sweet treat ideas. 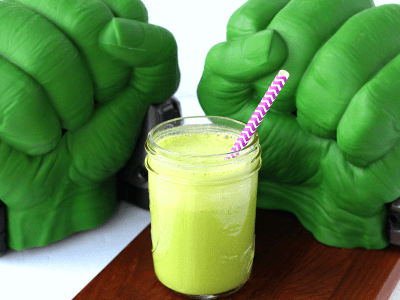 Check out our 6 favorite healthy Avengers Approved Recipes to fuel your kids’ day plus be sure to scroll down for a “super” giveaway! THINLY slice bananas on diagonal. PREPARE waffles according to package directions. SPREAD waffles with yogurt. Arrange banana slices on top, overlapping. Arrange mandarin oranges in center of each pizza. Drizzle with honey. Sprinkle with cinnamon. Garnish with raspberries or blueberries, if desired. PUREE pear and avocado with half of the almond milk in an emulsifier blender. ADD baby spinach and mint, process until smooth and creamy. Add remaining almond milk, blend. Serve immediately. MIX together almond butter, maple syrup and cinnamon until blended, in small bowl. SPREAD equal amounts of almond butter mixture over each tortilla. Sprinkle berries over almond butter mixture. 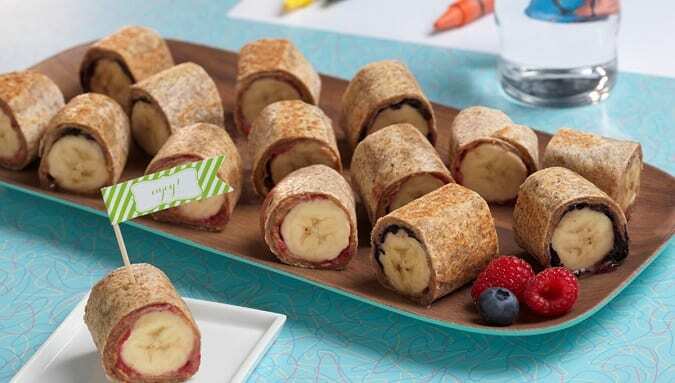 Slightly flatten each banana with a spatula and place over the berries and roll up. LIGHTLY spray skillet with cooking spray over medium-high heat, place wrapped tortillas in skillet and cook until lightly browned on all sides. REMOVE and cut into bite-sized pieces. COMBINE 1/2 cup teriyaki sauce, 2 tablespoons pineapple juice and oil; pour over meat pieces in shallow glass dish. Refrigerate; marinate 1 hour, turning occasionally. Thread meat on skewers alternating with vegetables and pineapple chunks. Discard remaining marinade. GRILL 4 to 5 inches from heat, turning skewers and brushing with additional marinade, about 15 minutes or until desired doneness. PLACE the cooked broccoli into an oven-proof dish, sprinkle with nutmeg and black pepper. COMBINE the cheese and breadcrumbs in a small bowl, then lightly scatter the breadcrumb mixture over the broccoli. BAKE for 15 minutes until contents are warm and the breadcrumbs have turned golden brown, remove from the oven and serve. HEAT grill to high heat. Slice bananas diagonally. Sprinkle with cinnamon and grill, for 3 minutes on each side. LAYER banana, yogurt, strawberries, blueberries, granola, honey, pomegranate seeds and mint leaves in parfait glasses. So whether you’re looking to power up your kids with a delicious meal, healthy snack or a sweet treat, Dole is ready to fuel your little super heroes with a little Marvel inspiration. 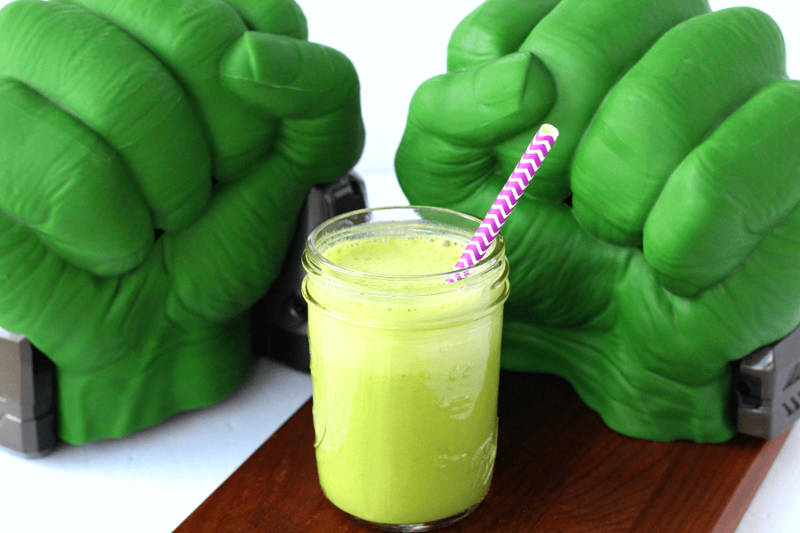 Grab more delicious Avengers approved recipes for kids at Dole.com/Marvel. 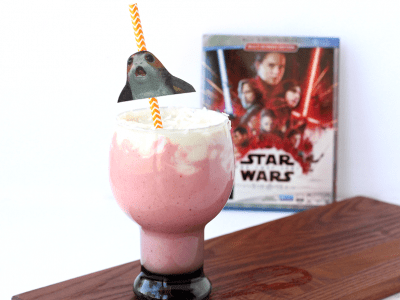 Celebrate the long anticipated The Last Jedi Blu-Ray release with this Crait-inspired Star Wars: The Last Jedi Smoothie. This post is sponsored by Lucasfilm. All galactic opinions are my own. May contain commissioned links. Is your family ready to own Star Wars history? The highest grossing film of 2017 (did I mention there were only a few weeks left of the year when it was released? 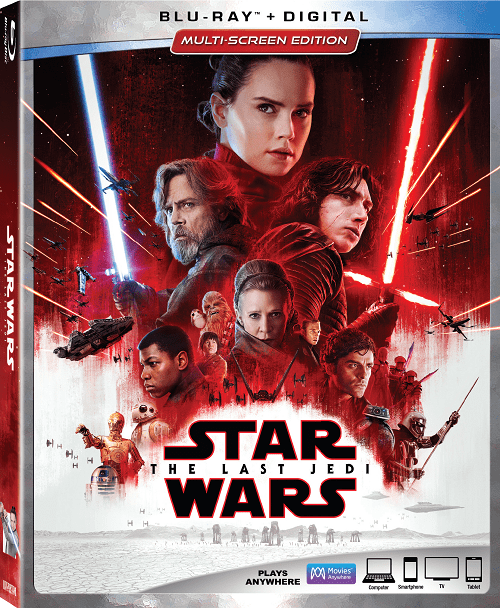 ), a beloved cast of characters, the first lead Asian heroine and surprising twists and turns in this action-packed film, it’s no wonder why we’re all rushing to own Star Wars: The Last Jedi on Blu-Ray this Tuesday March 27th. 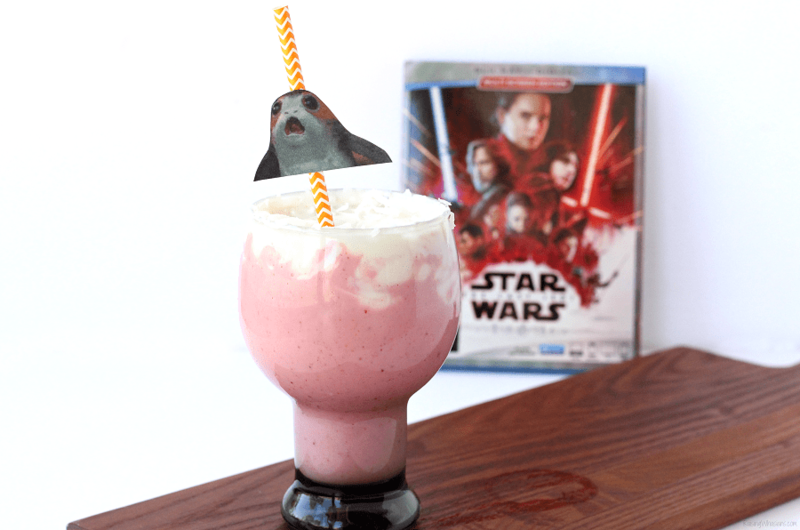 In case you’re already planning your next Star Wars themed movie night, I have the perfect Star Wars: The Last Jedi Smoothie to welcome in the fun with your new at-home release. 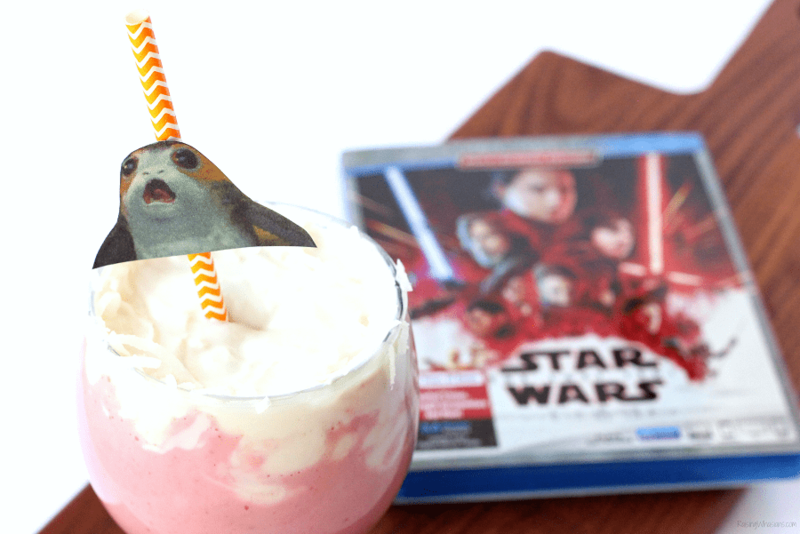 Grab the directions to make your own Crait inspired treat, grab the details on all of the fun bonus features – and Star Wars: The Last Jedi giveaway, anyone? More Star Wars? Yes, please! With 14 deleted scenes, exclusive behind-the-scenes looks and lots of Star Wars geekiness, The Star Wars: The Last Jedi bonus features do not disappoint. Be sure to check out Andy Serkis’ performance as Snoke! One of my favorite new places in this movie was the planet of Crait. The beautiful white sands covering the vibrant red salt mines were the perfect backdrop for the final battle of the film. 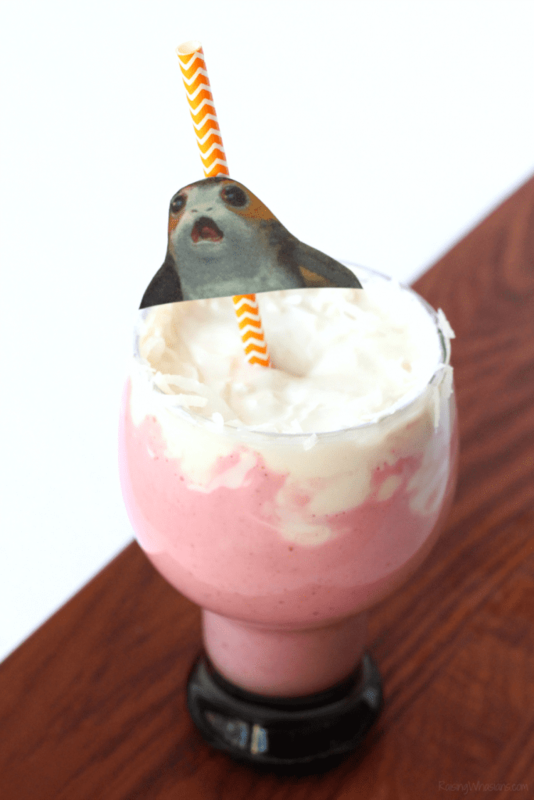 So fitting, I thought making a Crait Smoothie would be a fun way to celebrate the at-home release. Blend Strawberries and strawberry yogurt together until smooth. Pour into glass. Top and spread a thin layer of vanilla yogurt on top to create the white sand on top of the “red salt” layer. Get fancy and add a straw topper with a Porg. How cute! Now the best part – Enjoy! Bring the familia together for an unforgettable family movie night! Disney•Pixar’s Coco is now available on Blu-Ray and we’re celebrating the new at-home release with this delicious and easy Disney Pixar Coco Dessert Idea! 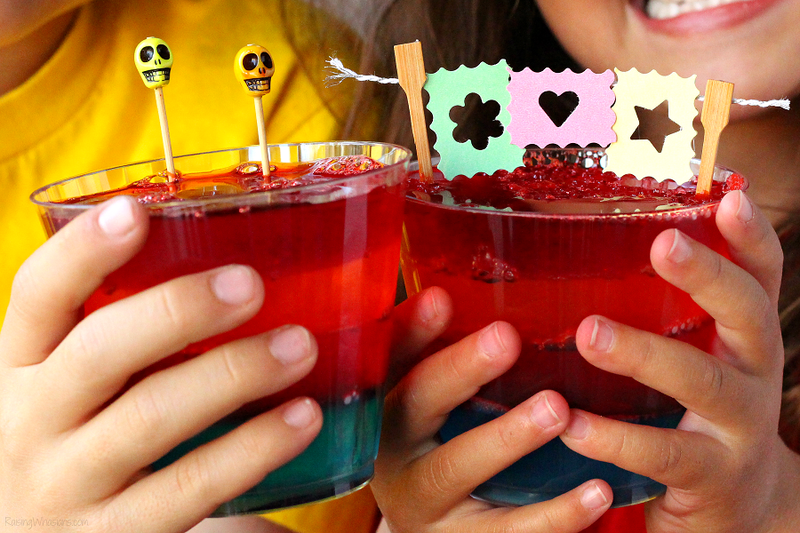 See why your family needs to own Coco on Blu-Ray with tons of great bonus features, plus make these FUN layered Coco inspired jello cups + adorable banner for a one-of-a-kind Coco movie night treat.